It's been far too long since you've had an English muffin pizza. The folks at Marshall Stack are here to fix that problem. 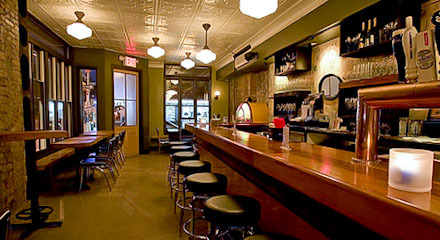 Just opened on the LES, the Stack is a feel-good bar that'll take you back to your formative days. It's hard not to feel at home in the comfortably raw space, with its century-old stripped walls. But first things first—toss some change in the jukebox to get things started (note: rock is imperative here, given the bar's namesake—stacks of famed Marshall amps). With some Zappa or Stones appropriately setting the tone, head to the old mahogany bar for some throwback contraband like $7.99 Night Train, $8.99 Boone's Strawberry Hill, or if you have some extra allowance this week, $10.99 Andre Cold Duck (if you can't have a good time on this stuff, there's no more hope for you). If you've got the munchies, owners Matthew and Justin (ex-manager of secret Italian rifle club Tiro) will serve you from a tiny ad-hoc kitchen at the end of the bar, complete with a venerable toaster oven. Try those tasty English Muffin Pizzas or the house special Blue Balls (grapes coated in blue cheese and candied nuts)—which prove to be much more pleasant than they sound. Which is a reminder that, luckily, some things have been left behind for good.